Whether you’re just starting out with a new company or youre a seasoned veteran looking to demonstrate your value, few qualities have the same impact as strong leadership. Leadership qualities–such as introducing new strategies or energizing staff to feel more connected with their work–lead to positive results that can be evidenced in a variety of ways, such as increased productivity or improved work satisfaction. While roughly a third of Americans don’t aim for leadership positions, according to a CareerBuilder survey, it’s safe to say that most aim to possess the leadership qualities that affect change and make a difference in the lives of the people with whom they work. Here are a few ways you can demonstrate leadership and drive influence in a non-management role. 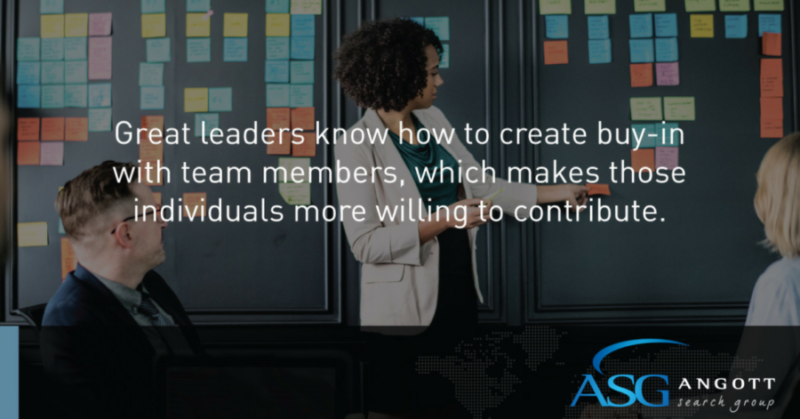 Great leaders know how to create buy-in with team members, which makes those individuals more willing to contribute. The best way to determine what inspires people to perform at their peak is by making a conscious effort to interact with them on a daily basis. You can do this by taking advantage of brainstorming sessions and analyzing themes from their responses. You may also want to connect with them through other communication channels to determine what makes them tick. Workers who seek an upper management position dont always have to wait until something opens for them to apply. Demonstrating initiative and offering solutions to problems can drive leadership opportunities. Oftentimes, new roles or positions formulate when individuals exemplify leadership. Sangeeta Bharadwaj Badal, principal scientist of entrepreneurship at Gallup, said one way of seeking out leadership opportunities comes from knowing what you do well. “Pay attention to what you like to do because you’ll be most successful when you’re working within your talent set – your natural patterns of thoughts, feelings and behavior,” Badal recommended. “Talent accelerates your engagement with a task or an activity.” Signs that you’re using your talents can include a greater sense of alertness, ease of performance or genuinely enjoying a task you’re engaged in, Badal added. Mahaffey in Forbes touched upon the importance of ensuring your message is understood by encouraging questions, such as in a group or team situation when offering instructions or presenting a particular point of view. If you want to demonstrate leadership capabilities, you have to think like a leader. For example, if problems develop that require brainstorming sessions, initiating a conversation about how to come up with a solution helps gets the ball rolling. True leadership requires more than donning your thinking cap or encouraging others to do the same. Encourage feedback by asking others to express their opinions about a proposed strategy, and come to a mutually agreed upon determination of how to proceed with a project or initiative. Then, map it all out in a project plan or PowerPoint deck, demonstrating your plan of attack. Leadership comes in all shapes and sizes. By adopting some of these behaviors, you can prove to your bosses that you’re not someone they can afford to lose and willing to do whatever it takes to succeed.